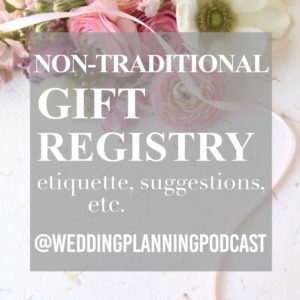 A listener wonders, is it tacky to register for non-traditional wedding gifts on your wedding registry? If you have your household all set up, why not include aspects of your actual wedding on the gift registry? Items like your wedding photographer, videographer, or your honeymoon? 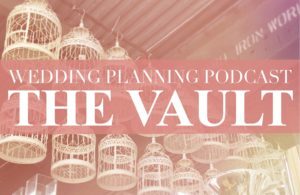 This episode has been archived, and is currently only available to members of THE WEDDING PLANNING PODCAST VAULT. Our friends at BlushDrop think registering for DIY-style wedding day videography is an awesome idea! Save $10 on your very own BlushDrop account with promo code WEDDINGPLANNINGPODCAST.